Having mostly resolved our coolant and overheating problem while aborting our Capitol Reef National Park visit, we continued east across Utah before turning south to Moab. Aside from being a 4×4 Mecca, Moab is conveniently positioned just outside Arches National Park and only a short drive to Canyonlands NP. And while neither of these has a shuttle system like that in Zion or Grand Canyon, Enterprise had very affordable cars available right in town, and they’ll even come pick you up if you are reasonably close. We took advantage of a $39/day rental car for five of the six days we stayed. Yes, significantly departing from our three day average, we actually stayed in one town for nearly a week for other than mechanical repair reasons, though we did shift campgrounds half way through. We spent our first full day visiting Arches NP, starting with the visitor center for the traditional short educational movie about the place, before moving on to a driving tour the full length of the park along all paved routes. 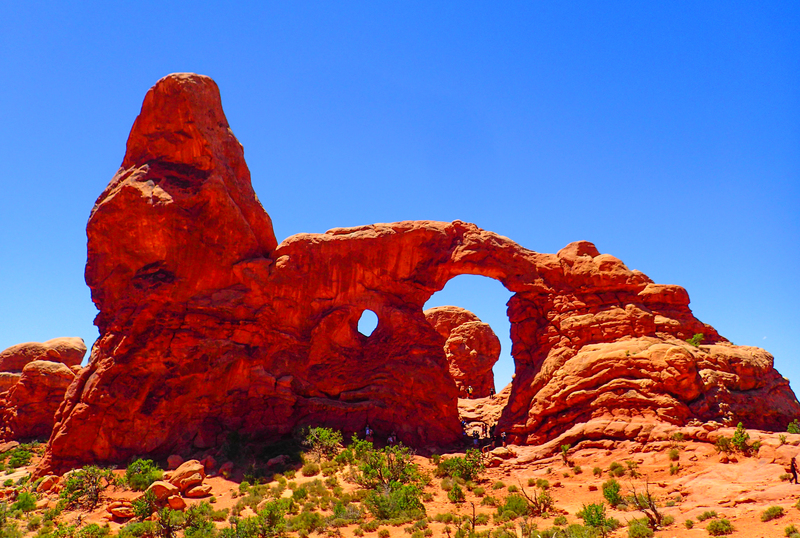 We stopped at most of the scenic and historical points, made a few short hikes to see the more impressive of the wind and water etched sandstone arches that are the namesake and hallmark of Arches National Park. 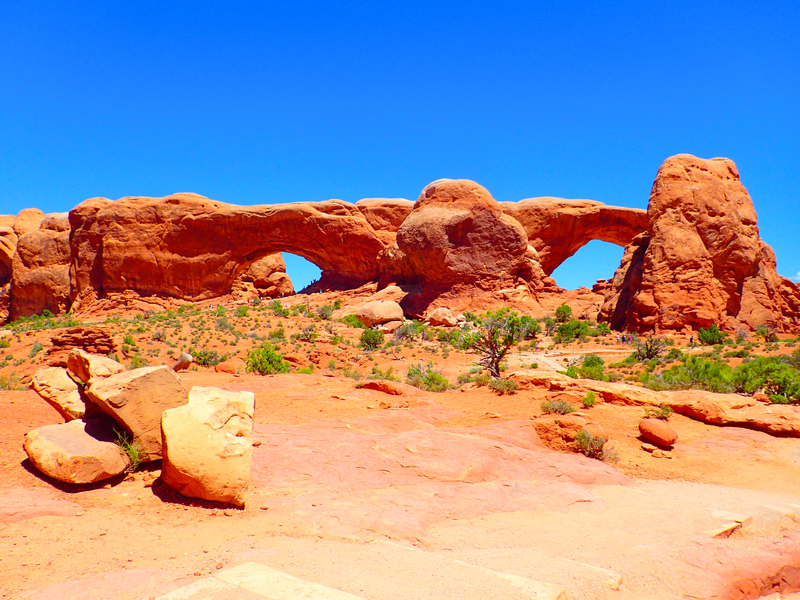 Our favorites were The Windows, Sand Dune, and Skyline Arches. The first for their impressive size and fun hike to see, the second for the unique path way to it, and the third for the isolation despite how accessible it is: only one other family was there during out hike, unlike the large crowds at The Windows. We spent a day visiting Canyonlands NP, with a stop at Dead Horse State Park along the way based upon my Dad’s recommendation. What a fantastic jewel that park is. Situated on a steep sided mesa with 2000 foot cliffs and a narrow neck only 90 feet wide connecting the official point to the main plateau. Cowboys used to use the geological oddity as a natural corral, herding wild horses onto the point and fencing off the neck, allowing them to pick out the best horses from the trapped herd. The views are stunning, rivaling anything at Canyonlands and even the Grand Canyon. 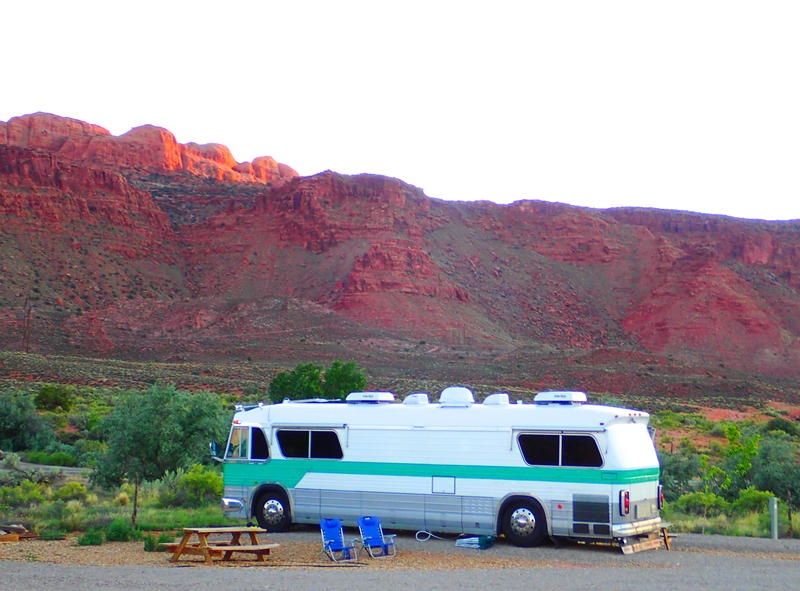 There is a small 21 site campground at Dead Horse that I will consider using if we return to the region since the views from the sites are so amazing, and at $28 a night, including electrical but no water hook ups, the price is reasonable. As for Canyonlands, we drove the full length of the park, stopping at many of the overlooks and short scenic trails. Top of the list was Mesa Arch, which we felt rivaled our favorites from Arches NP. A short one mile trail leads to the front of the arch, with the back side view presenting a steep cliffside drop. We completed our stay in Moab with a ranger led evening hike through Arches’ Fiery Furnace primitive trail. The three hour hike took us down into slot canyons and scrambling through the sun lit reddest rocks in the area, with occasional stop so that our guide could explain the geology, biology, and history of the area. In one of those small world encounters, our guide, Sam, went to the same high school I attended in 9th and 10th grades, though decades later. Though we could not come up with any teachers from my era still present during hers, it turned out she did have the same wrestling coach, Coach Carpenter. And yes, you gender conformist sexists, all the pronouns are correct in that sentence, heh. As for the campgrounds: in the summer low season members of Passport-America have four options for 50% discounted stays. We initially went with the A.C.T. Campground, a brand new endeavor owned and designed by an environmental engineer, that will eventually provide low energy Air Conditioned Tents (thus the name), but for now provides full hook up RV sites with some unusual amenities, including a community kitchen, dining area, and library. At $19.50 a night this is a hard to beat deal, the most affordable in town, even with three other Passport-America options. The only negatives were 1) the free wifi was, as expected, RV park typical with a weak signal and limited availability during peak hours, and 2) while they had clearly spared few expenses in the construction of the campground, they did go cheap on the tree planting, with one tiny little thing between each site that will take a decade of growth before providing any shade. Since we had a rental car we explored the other Passport-America options, and for our last three nights we elected to shift down to Spanish Trails RV. Though slightly further from downtown and $2.50 more per night, Spanish Trails had the advantage of mature growth trees shading nearly every site, unless you specifically wanted a completely clear spot for your satellite TV. 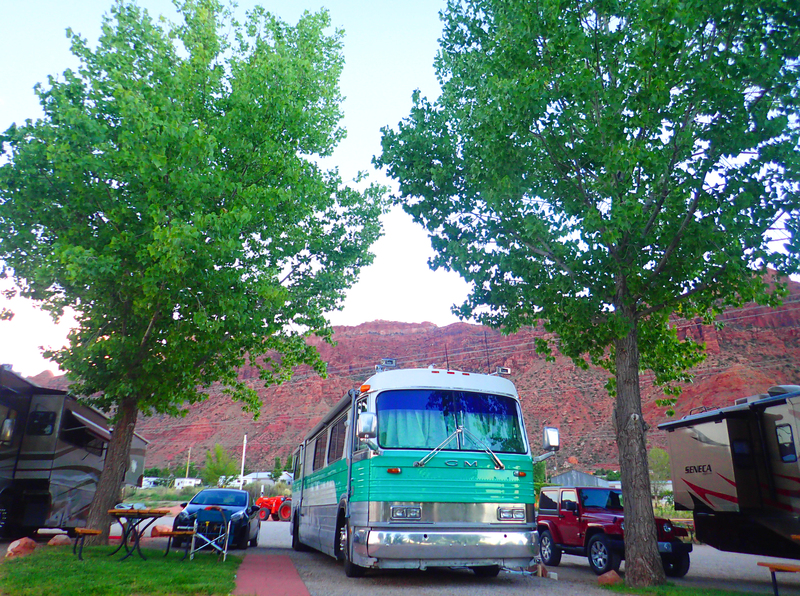 The trees, greater distance from the main road, and landscaping were worth the extra couple of bucks for us, though the wifi was, again, RV park typical. To there credit, the front desk staff genuinely sought to make it better, asking detailed question about the specific problems we encountered. We also thoroughly enjoyed our robust steak meal at Susie’s Branding Iron Restaurant just across the street. We split an entrée, and without asking they brought it out already apportioned onto two plates, with obvious extra side dishes to make our meal that much better. We encountered one oddity during our transfer: as we were departing ACT The Big Kahuna repeatedly stalled as i decelerated. He just refused to come down into the lowest gear for a few minutes. The problem went away after a few minutes and we continued on our way, but considering our mention of it foreshadowing of a future post and our current mechanical problem. More on that later. ← A coolant leak, an overheating learning curve, and skipping Bryce and Capitol Reef National Parks.